These Farm Heroes level 197 cheats and tips will help you beat level 197 of Farm Heroes. 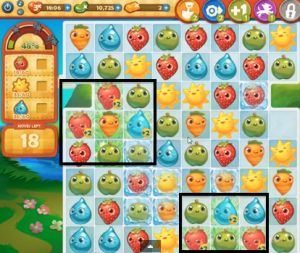 The objective of Farm Heroes level 197 is to achieve 100% growth and collect 60 strawberries, 60 suns, and 60 droplets in 30 moves. 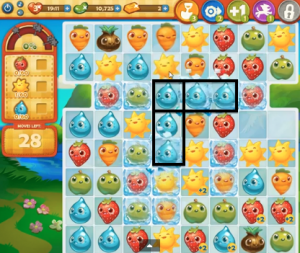 The ice in level 197 greatly divides the board and makes matching cropsies difficult. Start the level by breaking as much ice as possible to unify the board. Cropsies will no longer be separated and matches will be easier to make. You are given two seeds at the beginning of Farm Heroes Saga Level 197. Match them with water in an open space to make a cross of grass that will give cropsies bonus points when matches. Be sure to match the seed in an open space so that no grass squares get cut off by the borders of the board. 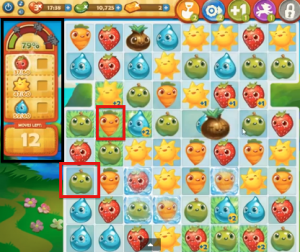 Carrots and apples are the only non-essential cropsies on this level, and making matches of them only wastes moves. Keep an eye on your objective box throughout the level so you are reminded which cropsies are essential to beating Farm Heroes Saga Level 197 and are spared any wasted moves.